Throw your gloves on the ground and challenge your enemy to a duel! …and then line up three pairs and clear a line! 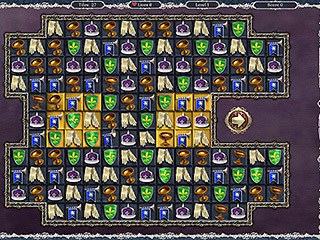 In Jewel Match Royal Collector’s Edition, you will be matching three of a kinds all over the place in a Renaissance setting. There is even a romantic storyline to take you along the way in the adventure. If you think about it, folks back then weren’t much different than people today. Can you help this peasant court the fair princess of Nerinia? It’s the kind of thing that fairy tales are made of: the humble royal gardener’s son falls head-over-heels for the princess and has to convince her to overcome the socioeconomic boundaries and take a romantic interest in him. If you think about it, folks back then weren’t much different than people today. Can you help this peasant court the fair princess of Nerinia? Find out in Jewel Match Royal Collector’s Edition! Now, the name of the gardener’s son is Matthew, and while he is fairly wealthy, his social status is too low for the likes of Princess Sofia. Enter Queen Meredith. The queen naturally wants to protect the kingdom and her daughter from the shame of breaking traditions that go way back. Not even true love is worth it. But, as we know from other fairy tales, there have been precedents set before in which a commoner is able to climb the prosperity ladder by performing great tasks of strength and bravery and what not. So, Queen Meredith has appointed Matthew with the great task of restoring the kingdom’s old dilapidated estates and ancient castles that are falling into disarray. Do this and Matthew becomes nobility that is worthy of Princess Sofia’s hand in marriage! As Matthew moves through the ranks of knighthood to dukedom, you will be able to restore all sorts of cool artistic sceneries using the nifty little decorations that you can unlock along the way in this Match Three adventure. There are 160 levels, which are sure to keep you occupied for quite some time – excellent for playing as you wait in line at the store. 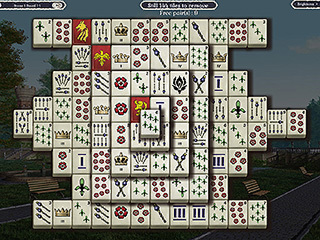 There are even an additional 54 replayable bonus games (including Mahjong), which means that you have over 200 unique games/levels to play with! Lots of bang for your buck on this one! There is a Royal Shop where you can buy power-ups for the game play to add an extra edge of excitement. 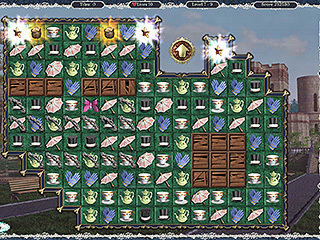 Check out Jewel Match Royal Collector’s Edition today! This is Jewel Match Royal review. Download this game here.